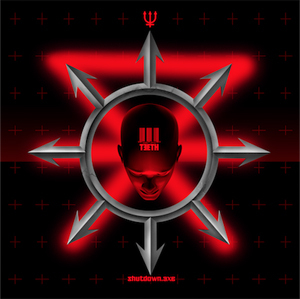 Los Angeles based industrial band 3TEETH has unveiled plans to release their second full-length album, shutdown.exe, on May 19th via OMF Records. Today, the band reveals the album title, release date, artwork and track listing for the upcoming record. Additional details and music will be disclosed in the coming weeks. Follow the band at https://www.facebook.com/3Teeth for additional updates. 3TEETH’s shutdown.exe, the long-awaited follow-up to their self-titled, 2014 album, was self-produced by the band, mixed by Sean Beavan (NINE INCH NAILS, MARILYN MANSON, A PERFECT CIRCLE) and mastered by Howie Wienberg (DEFTONES, NIRVANA, PANTERA, SMASHING PUMPKINS, SOUNDGARDEN). The album features 13 songs that push their sound into new, undiscovered realms of orchestrated chaos and divine carnage with their signature fusion of experimental industrial, metal and synth driven rock that the band has become known for over the last several years. Watch 3TEETH’s video for “Atrophy” from shutdown.exe on KNAC.COM right HERE. Discussing the concepts behind the new record, frontman Alexis Mincolla says, “"The album centers around the idea of shutting down consensus reality tunnels, which is a way to describe the generally agreed-upon perspectives of what is considered real." Following a monumental, 2016 tour of the U.S. with legendary rock band TOOL, 3TEETH is riding a wave of momentum and anticipation leading up to the release of shutdown.exe. Stay tuned for more details regarding one of the year’s most awaited releases.